To be safe you might consider a small investment in your personal self defense. 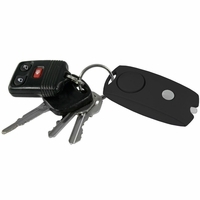 We have many items including pepper spray and stun guns, to improve your personal security and provide protection that is convenient and easy to use. Many of these portable alarms are great for children to summon assistance if being abducted or otherwise bothered by strangers. "Black w Screwdriver(+0.25)" "Pink w Screwdriver(+0.25)"
"Polycarbonate Swivel" "Polycarbonate No Swivel"
"Oval Shape Gold" "Oval Shape Copper HO4CO" "Hercules Green Speckle" "Oval Shape Pink HO4PK" "Oval Shape Silver HO4SL" "Hercules Black" "Hercules Antique" "Hercules Silver" "Hercules Gold" "Hercules Purple"
"Medium Brown" "Large Gold(+1.00)" "Large Light Grey(+1.00)" "Medium Brown" "Medium Dark Green" "Medium Black" "Medium Blue" "Large Blue(+1.00)" "Large Purple(+1.00)"